Our happy-hour columnist answers reader questions. This week’s happy-hour questions are about beers and cocktails on the Eastside and in North Seattle respectively, along with a query about outdoor seating for a large party because the sun is out for the moment and it’s beach-umbrella drink weather. Is it five o’clock yet? Questions were edited for brevity or clarification. Q: I heard this was a great area for craft beer, but when I moved to Kirkland I quickly learned people meant Seattle. Where can I find a good craft-beer place on the Eastside? A: You got one in your town: Thirsty Hop, opened six months ago in a strip mall, is a 21-tap bar that features many stellar craft beers in the West Coast including two local favorites, Reuben’s Brews and Black Raven Brewing — the latter also has a tasting room in Redmond, another great pit stop for a pint on the Eastside. Thirsty Hop is also one of the few places that now carries Black Raven’s blueberry brew, Kitty Kat Blues Pale, that all the cool kids want. Thirsty Hop, 13102 N.E. 70th Place, Kirkland (425-896-8320 or thirstyhop.wordpress.com). Black Raven Brewing Co., 14679 N.E. 95th St., Redmond (425-881-3020 or blackravenbrewing.com). Q: Getting a drink at a craft-cocktail bar, especially on Capitol Hill, is such a hassle with traffic and parking. That’s true even in Ballard, and I live in nearby Greenwood. What’s my best bet, north of Ballard? Since Washington's craft-distillery law passed in 2008, more than 100 distilleries have popped up around the state. 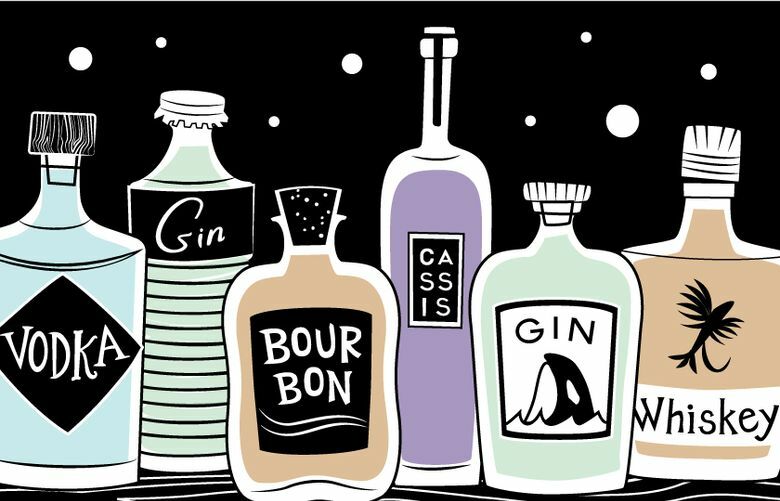 Here's our guide to some of the locally made gins, vodkas and whiskeys that should be on your radar. A: You got one of the best cocktail bars in your own backyard, maybe even close enough to stumble home instead of calling Uber. Oliver’s Twist makes great drinks, and the added benefit is that cocktails are $2 to $3 cheaper in your ’hood than on Capitol Hill. Get the peppery Manhattan, “Duff and Blathers, ” and its contemporary spin on a Seattle favorite, the Old Pal, made here with rye, Campari, sweet vermouth, absinthe and Peychaud’s bitters. Also on the main drag is a great under-the-radar bar, Teachers Lounge, that serves some serious boozy concoctions. Oliver’s Twist, 6822 Greenwood Ave. N. (206-706-6673 or oliverstwistseattle.com). Teachers Lounge, 8505 Greenwood Ave. N. (206-706-2880 or teachersloungeseattle.com). Q: My daughter is graduating from grad school. We would like to have a group of about 20 come together someplace for cocktails and appetizers, but it’s hard to find an outdoor-seating area that can accommodate us. A:Psst. No one knows that Monsoon’s rooftop bar on Capitol Hill is scheduled to open next week. You can book for up to 30 people up there. While you’re at it, maybe you can introduce your daughter to some fine imbibing if she hasn’t landed a job yet to afford the top-shelf stuff. Monsoon has easily one of the best flight deals in the city after 9 p.m. when the bar does flights of its best spirits for half off. The special is three shots, each one-ounce pour. Check out its flight of three Japanese single malts including the Hibiki 17 year for $21. Or its flight of brandies including two of the best in the United States, from St. George Spirits and Clear Creek Distillery, along with Laird’s apple brandy for only $10. Monsoon, 615 19th Ave. E. (206-325-2111or monsoonrestaurants.com/Seattle).